Though everything was great, these polenta rounds really stole the show. I cheated and used the polenta in a tube to save some time, but brushed it with olive oil and grilled to get those nice char lines and enhance their flavor. On top went red onions and shiitake mushrooms that I sauteed in butter and Gorgonzola cheese. Ran them under the broiler for a few minutes, then drizzled with balsamic syrup. They were just incredible. 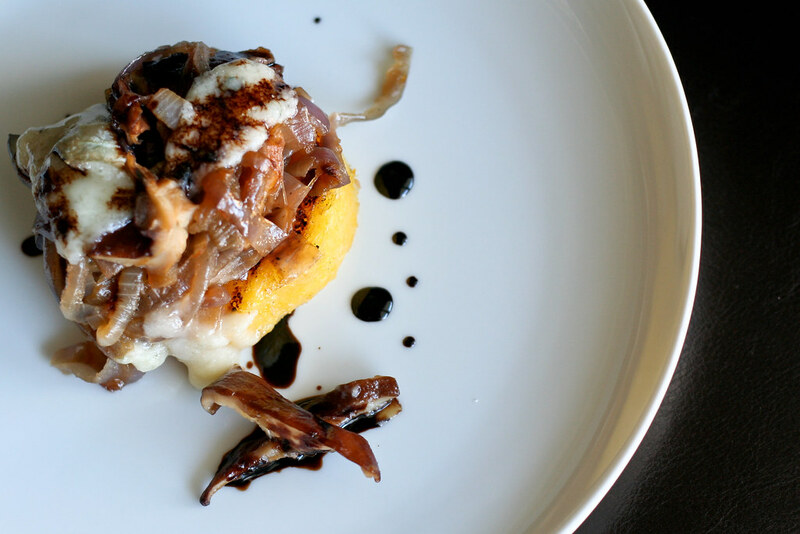 The mushrooms were almost meaty, the onions sweet, the cheese sufficiently funky and the balsamic syrupy and tart. A very successful appetizer and definitely a keeper. Just a reminder, Friday’s the last day to vote for me on Saveur’s Best Food Blog Awards! Get on over there and vote! Please and Thank you. You’ll have leftover balsamic syrup. This will keep in a sealed jar in the fridge for a few months. Place the balsamic vinegar in a small saucepan and set over medium heat. Once it comes to a boil, reduce to low and cook for 20 – 30 minutes, or until the vinegar reduces and becomes syrupy. It’s done when it coats the back of a spoon or silicone spatula. Remove from heat and set aside. While the balsamic is reducing, heat a large skillet over medium-high. Once it’s hot, melt the butter and add the onions. Cook for about 10 minutes, or until the onions soften and begin to brown. Add the mushrooms and cook for another 10 minutes. Remove from heat and set aside. If you have a grill pan, place it over medium-high heat. (If you don’t, a regular skillet will be fine.) Slice the polenta into 1/2-inch rounds and brush both sides with olive oil. Grill for about 3 minutes on each side or until the polenta turns golden and develops grill lines. Remove them to an oven-safe platter. Top each polenta round with a heaping spoonful of the onions and mushrooms. Crumble some Gorgonzola over each round, then run them under your broiler for about 3 minutes, or until the cheese just melts. Remove and drizzle with some balsamic syrup. I want this for lunch today, immediately, right now. Looks so delicious! I love piling things onto polenta and then eating the rounds like mini-pizzas. This combination of ingredients looks absolutely delicious! Mel – These look really great….what did you think about using the polenta in a tube? I’ve tried making a few bites like this in the past, but struggle to make polenta that really holds together when being pan-fried. Perhaps the polenta log is the answer? Oui, Chef – I know what you mean. Homemade polenta does have a tendency to fall apart at times, especially when you grill it. Some solutions are to add shredded mozzerella, which will help it keep its shape, or the polenta log. I’m actually a big fan of the log if you’re going to grill or pan fry it. Very handy for stuff like that, though I’d never try to “re-soften” it into the creamy kind. Oh Mel! I love the addition of gorgonzola to this! Quite wonderful. This was not my favorite! I borrow recipes from you all the time, and usually they are fantastic. This one I was not a fan of though. Something about the flavors didn’t really work for me (or my husband) all together. Your meals are still near perfect though so I remain devoted. Thank you for this recipe. I’ll make it for my fiancÃ© tonight. And also thanks for the hint about the polenta tube. I was about to soften it but decided against it based on your post. This is such a gorgeous dish. Totally something you would find in Italy. Shiitake seems like an odd mushroom to use in a non-Asian dish. Could you substitute it with portabella for similarly delicious results? I cannot believe that it has taken me so many years to find your absolutely fantastic blog. What incredible recipes and superb photography! I’m now signed up to follow your RSS feed. This polenta recipe is simply to die-for….my Italian family just loves polenta!!! I found your site through The Kitchn. 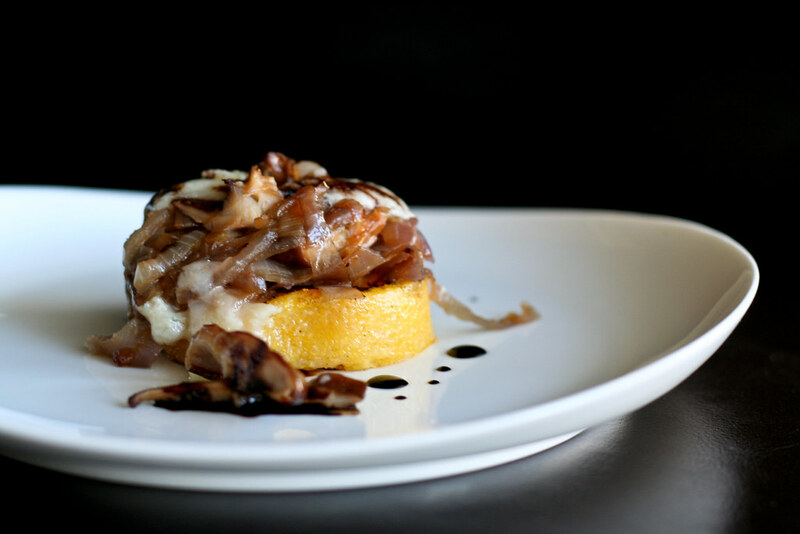 I love the idea behind this dish, as the trio of mushrooms, onions, and cheese is one of my favorites. Thanks for the inspiration!